Both Honey and Phoebe have returned! The duck soap opera continues at Botany Pond. 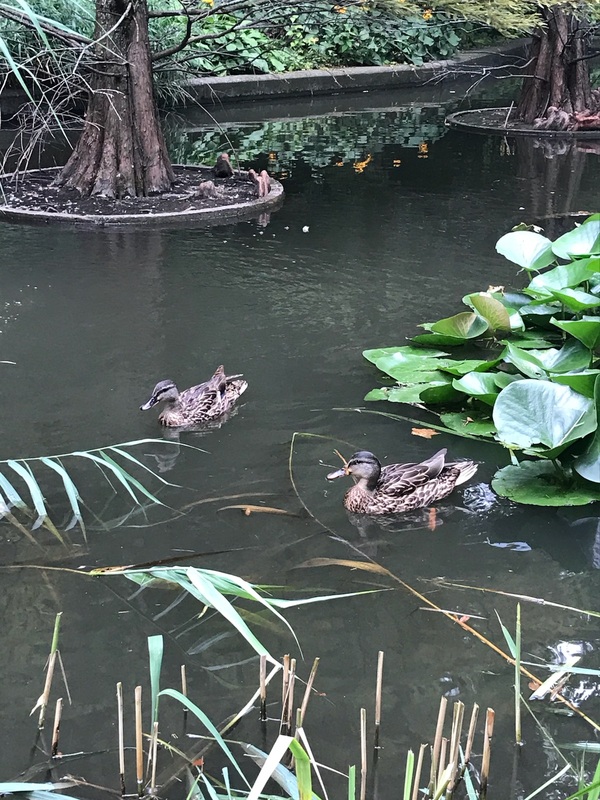 Yesterday we learned that, after both ducks were driven away by chainsaws and commotion as the Pond’s reeds were cut down by an unwise order from Buildings and Grounds, Honey returned after a day’s absence. Phoebe remained AWOL. It was PHOEBE, who came back after her mom Honey had returned earlier in the day! And there’s no doubt it was Phoebe: she was young, had the dark bill that set her apart from the other ducklings, and, most important, came when Anna whistled and also “knew the drill” about feeding. Lord knows where both ducks had been. Phoebe, at least, can fly, but as you can see from the photo below, Honey’s wing feathers aren’t yet fully grown, and I haven’t seen her fly. She might have waddled away and hid! Without a GPS affixed to them—and ornithologists can now do this with ducks—I am left with no knowledge of where they went. Now the two are biding their time till migration, and I’m happy they’re reunited and that poor bullied Phoebe is swimming around with her mom. They’re still acting skittish—chainsaws will do that to ducks. Anna says she’ll feed them copiously, getting them ready for the Big Trip South. I’m pretty sure they’ll still be around when I return on Sunday. And then, I hope, the two will soon depart together, steering by the stars as they flap their way across the night sky to warmer climes. Here they are yesterday afternoon, with Honey to the right. This entry was written by whyevolutionistrue and posted on August 16, 2018 at 8:00 am and filed under ducklings, ducks. Bookmark the permalink. Follow any comments here with the RSS feed for this post. Both comments and trackbacks are currently closed. What a saga! Good to know that both are doing fine. Using a chainsaw to cut reeds. Kind of like a sledge hammer to go after a mosquito. I doubt they were actual chainsaws. Probably 2-stroke hedgers. They’re as loud as a chainsaw, but would cut down reeds a lot easier. I too was wondering about using a chainsaw to cut reeds! Whatever it was, surely it could have waited until after the ducks depart. So glad to hear th Honey and Phoebe have returned. Here the Australian Wood Duck seem to be going into breeding season. They sit in trees and make a call rather like an incompetent kookaburra! Yeah, should have waited, consulted with the duck handlers. What the hell were they thinking? You knock down the reeds in the fall when things are dying anyway. Pathetic! Please don’t generalize too much. My grandfather was a groundskeeper at a country club at the end of his career. But, it was the work he could find during and after the depression. He was not an enemy of nature; he could get wild birds to land on his wrist and eat seed out of his hand. I learned a lot from him about living peacefully with nature, too. That would completely eradicate the reeds, so they won’t want to use that. I suppose next though either Honey or Phoebe will be accused of a murder she didn’t commit and have to go through a legal nightmare that will end with either a surprise revelation or amnesia. Do we know where mallards go in the winter, or indeed if they all go anywhere at all? I don’t know if the ones we see in winter are the same ones we see in summer. We are only a few miles north of you and I have photos from last year of mallards scrounging around our bird feeders in late December and a lot of them in mid-Feb. They waddle up to pick through the seeds that the small birds spill, and seem to be in active competition with the resident squirrels. Later into the spring, we saw one pair (I assume) at the feeder a lot, with the drake standing guard (and pecking at the unperturbed squirrels) while the duck fed. No ducks in the Jan pics, but I don’t know if that’s just chance. I have no idea, but you might improve the duck food at your feeder!!! Unless someone has something better I believe many of the ducks, just like the geese are local. Meaning they do no do the natural migration. They do move further south during the winter if necessary to find open water. We have ducks and geese here in Wichita, Kansas that are here nearly all year. The geese that are born here are the local type. They would not have the migration instinct. In other words, if you breed and have young here, why would you fly north as many others do in the spring to breed. I think you are right about open water. I have plenty of pics of Canada geese standing around on the ice, but not of ducks – although they seem to need only a limited amount of space to return. Perhaps just enough to make them feel safe or to allow for feeding. State DNRs are also a good source. Is there an ornithologist at the university who could tag Honey and Phoebe with GPS? Just to give you peace of mind — or maybe that would make it worse. I can imagine you following the ducks on their migration! I was thinking that when PCC actually goes into real retirement someday 😊 maybe he could write a child’s book about Honey. There is plenty of excitement at Botany Pond plus it could be a fine teaching tool regarding feeding etc. and what does happen with many ducks in the winter. I still worry a bit about Phoebe’s “failure to launch” so far. She seems very timid. But, I also hold out hope that she is just cautious and she’ll soon get bored with Mum and venture out to the world (or perhaps, she’ll eye a local drake and get the idea). I know I’m anthropomorphising but perhaps Phoebe just wants to hang out at the pond, swim around, catch some rays, and get all those noms without being harassed by her brothers and sisters. That’s what I like to think! She is free at last to be a social duk! The daily doings at Duck Pond would be a wonderful addition to Netflix. As someone who spent a bit of time working in a parks department, I can honestly say that the people in charge of caring for our green spaces are the least capable of doing so intelligently. Glad the ducks are ok.
Is there a reason you haven’t had them fitted with GPS? There are so many laws and regulations about what you can and cannot do to migratory birds. Although shooting them is OK. I am deighted to see this news Jerry. Your duck posts have been wonderfully heartwarming over the last few months, I really have enjoyed them. Seeing the ducks growing and being nurtured has been quite lovely, and I was very upset at the news which followed the landscaping work. Thanks for sharing your duck adventures with us, and good luck to Honey, Phoebe, and all her siblings. I am already looking forward to next year’s installments. Thanks again for the heartwarming duck posts and long may they continue. What a relief! Thanks for letting us know.